The print size is 23.5" x 23". Celebrate the joyous spirit of the holiday season with this latest work from artist Charles Wysocki. With Jingle Bell Teddy and Friends , Wysocki says, "I am once again harkening back to my youth, looking at Christmas through the wondering eyes of a child. I remember, as a boy, dreaming of building an enormous teddy bear in the snow and here, finally, I've done just that." The antique Christmas ornaments and Santas perched in and around the tree have a personal significance to Wysocki. "We really celebrate Christmas," explains Charles Wysocki. "We decorate the house from top to bottom. And collecting these little Santa and ornaments is something special my wife and I have done together throughout the years." 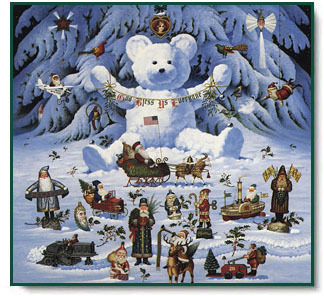 1990 Christmas Print: Jingle Bell Teddy and Friends copyright © by Charles Wysocki.